I have recently been in Pune to visit my younger brother and get some official work done. My brother wanted to treat me for my birthday and gave a couple of restaurant options. Of the restaurants, this name caught my attention: 'Yolk-shire'. And I will never regret this choice. I love eggs, I can have it all through the day. And this place serves egg based dishes. The menu, or as they call it 'Hatching Now', includes from a simple omelette and scrambled eggs to eggs in burgers and sandwiches and the more fancy omelette florentine. And the price rather wont burn any holes in your pocket. This restaurant is styled like a cafe with outside sitting arrangements. Situated near Karishma Society in Pune and surrounded by other nice eating joints. But once you try food at Yolkshire you won't regret. We ordered a Mexican Salsa Verde and Omelette Reve and we got served not only the main dish but accompaniments like baked beans in tomato sauce, a green leafy salad, some sauteed potatoes and buttered toast. Mexican Salsa Verde was an omelette wrap filled with shredded chicken and green salsa (as the name suggests). The filling was a bit tangy and that definitely added an extra edge to this whole dish. 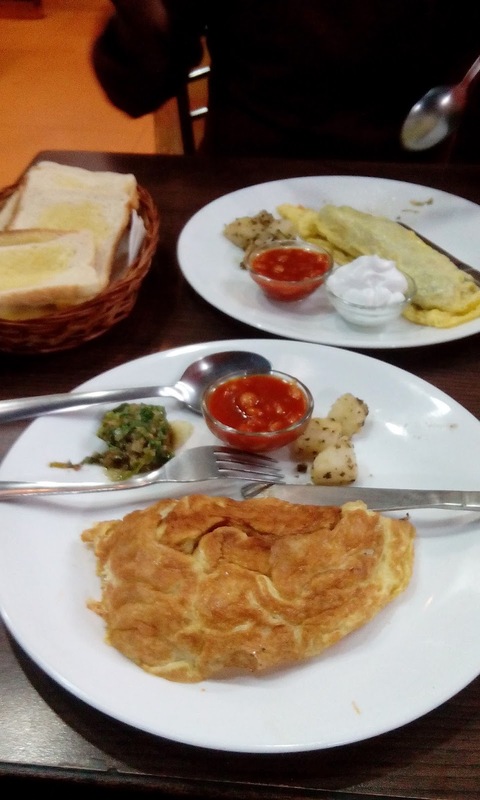 While, the Omelette Reve was again an omelette wrap filled with chunks of chicken in a tomato and red pepper sauce. This was yummy as well! This place also offers eggs cooked in Lebanese, Thai and Indian style to name a few, a lot of options indeed. They also serve Irish Breakfast, always brings a smile to my face. So many options that I have a strong urge to go back again and try some new dishes. I would definitely recommend all egg lovers to this place. A very unique place and definitely worth the price. To top it all up there is a shop selling 'Cad B', a super thick cadbury chocolate milk shake. Definitely try this Cad B once. A quickie which will comfort your belly !